King’s Apartment is an ideal property for commercial guests and families that appreciate peaceful and relaxing location. Apartment building is located in very quiet corner of Seaforth Road with King’s Apartment situated on the ground floor. 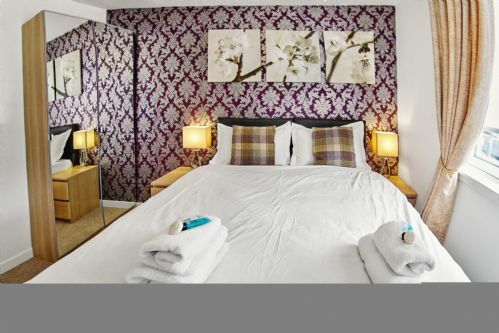 We are 10 minutes walk to Aberdeen Beach, Sports Village and main high street full of restaurants and places of interests. King’s Apartment features modern and large dining kitchen, spacious lounge equipped with corner sofa and patio door, 2 good size bedrooms overlooking front garden. Apartment is wheel chair accessible and there are no steps for the easiest access. Each apartment benefits from free allocated parking space. There are also free visitor parking spaces, however is not possible to reserve an extra parking space. Great host. Very clean. Assigned parking in a private lot adjacent to the building. About a mile from most attractions. The only downside is sleeping. The beds are very hard and you should bring your own pillows. The pillows are limp and empty in all beds. Ideal location for visiting family in danestone. Car parking a much added bonus. Central location for getting out and about round town and to the beach area. Ideal home from home. This is the second time that we have stayed in Kings apartment. We had a lovely stay again at the Kings apartment, perfect location between city centre and the university. Comfortable beds and well equipped kitchen. Great value apartment that was perfect for our stay. Good size and in a great location for the Exhibition Center and the town center. 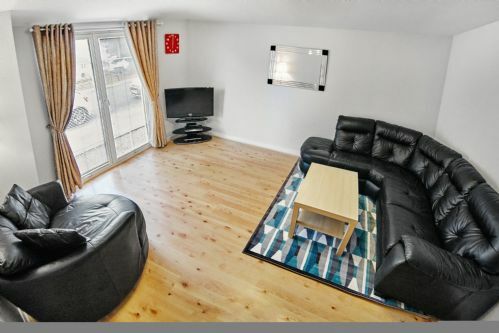 Kings Apartment is well furnished, clean and comfortable apartment situated close to the city centre but in a quiet area. Great amenities including wifi and parking. Nice touch with tea/coffee and toiletries. Booking was easy and communications were very clear. Would definitely use again and recommend to others. Thank you for being so helpful Lucas, would definitely stay again. The apartment was very clean and perfectly appointed. We arrived at the property, where Lucas was waiting to meet us. Booking, and subsequent communication with Lucas, were straight forward. This was the beginning of a fabulous visit to Aberdeen. The property was clean, spacious, modern, well located and immaculately presented. A 5 min walk to Codonas, amusement park, and 5 min drive to the city centre. An excellent stay for us. Once again, thank you Lucas, we will be back. Steve and Ariel. The only things we missed were a broom (we saw the little one) and some tatters to use when the floor is wet,. We enjoyed our stay here. It had everything we needed. Would definitely stay again. Staff were fabulous. Stayed for 3 nights in July and loved the location and apartment was clean and had tea coffee sugar dishwasher tablets and fairy liquid. Close to beach and union st for shops! Could maybe do with extra pillows and a hoover as would like to hoover crumbs up after kids before we left. But overall excellent apartment and would definitely recommend to others. We were in Aberdeen with two sons, 16 and 19, to attend our daughters graduation. Everything we needed was there (the only thing we missed was better frying pan). The location was very good and it is a quiet and calm neighberhood at night. 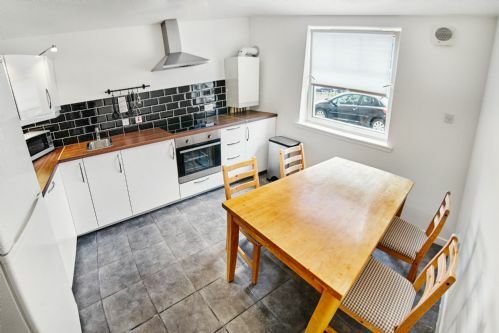 Very clean, simple flat but with lots of necessities that are not provided in all self-catering places: toilet paper, washing-up liquid and tea towels, towels and bedlinen, soap, teas and coffees etc. Lots of plates and cutlery, good cooking equipment, even dishwasher (plus tablets!) and washing machine. Very comfy beds. Easy dedicated parking and ground-floor flat. Good location, walkable to beach, town and swimming pool. Met by friendly owner and shown round but self-checkout made leaving at a time of your own choosing easy. Would recommend and would use again. Thank you. Had a lovely stay at the apartments very comfortable and clean. On arrival we were met by a lovely gentleman who showed us around and explained any thing we needed to know. The apartment was lovely, clean and spacious. It was well located to walk to the promenade and to the shops. The purpose of our visit was to watch football and the apartment was within easy reach of where we went. Stayed here for a weekend recently - nice place, walking distance to city center. Enjoyed it - recommended. El apartamento está muy bien situado. La zona es muy tranquila . Me gustó todo pero sobre todo la cocina que era amplia y cómoda. Me trataron muy bien. Gracias. Spotlessly clean and spacious for 2a and 1c, good central location for the city and fab that there was a parking space. Someone met us with the keys to get in and we deposited them in a box when we left. Excellent value for money. Only a few minor points - needs more plates/cups, a bin in the bathroom and some of the light bulbs didn't work. Would def recommend. Lovely central apartment in quiet area close to union street, universities and restaurants. Apartment has large lounge and kitchen area for eating in. Will return again soon. Nice location, nice apartment. Could have been made a bit more comfortable for watching TV, if few cushions were supplied on sofa. Also TV picture quite bad, think new TV will have to be supplied soon. Also maybe supply proper size bath towels as oppose to ones just a little bigger than hand towels. That said it was still a lovely apartment. I stayed eight nights at King’s Apartment because I attended a conference at the Aberdeen Exhibition and Conference Centre. 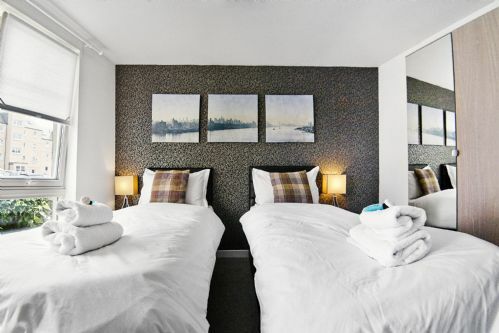 I can highly recommend the place: it is roomy, very well equipped (great beds! ), quiet, clean and comfortable. It is within walking distance to supermarkets, other shops and restaurants. It was perfectly situated for my purposes because many bus lines from the city center to the conference venue run close-by the house. Also, Lucas is a very caring and helpful host. 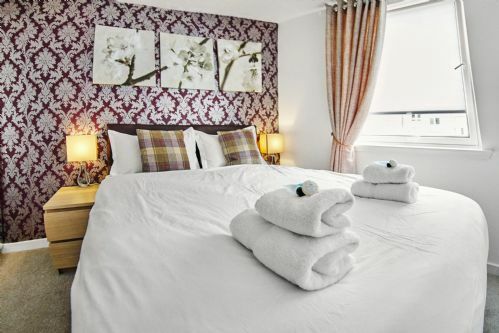 I would definitely try to stay at the King’s Apartment if I came to Aberdeen again! Die Unterkunft ist zu empfehlen. We had everything what we needed during our stay there. Comfortable beds, a clean bathroom, a tidy, clean and well equipped kitchen for our breakfast and dinner, a relaxing living room for all family members. We are thinking to come back sometime again. We really enjoyed our stay at King's Apartment / in Aberdeen. The place was very clean an comfortable, the localisation is great - close to both university and city centre, as well as the seaside. Contact with the hosts was excellent. There could be more cosmetics (shower gel/shampoo/soap) for such a long stay, but that would be my only advice for improvement! Loved the location of this apartment, facilities were good. Tried to book again as we liked it so much but the availability was not there. Would def stay again. A very well appointed apartment that was everything and more than we hoped for having booked from NZ last year. Despite being late due to rush hour traffic we were met and nothing was a problem. Excellent parking and plenty of room to move for the four of us. As a family of 4, we had an excellent stay. The apartment was ideal for us. Spotlessly clean. Friendly, personalised service. Just needs a few more pieces of crockery. Setting for 4, but ideally could have 8. Not an issue in anyway at all. We will definitely be back. Thank you! Great place to stay. Loads of parking. Very clean. Very spacious.had loads of utensils in the kitchen. Beds very comfy only down side there was only 1 pillow each and I prefer sleeping with 2 (but that's just being picky) overall brilliant place to stay will Defo go back. a well located, spacious and fully equipped apartment. A very spacious, well equipped apartment, right down to an iron (and board) and a hair dryer being provided. Clean and comfortable with good support from the staff. All at a very good price. Recommended - we will definitely book again. Had a comfortable few days here, visiting our son at Aberdeen university. 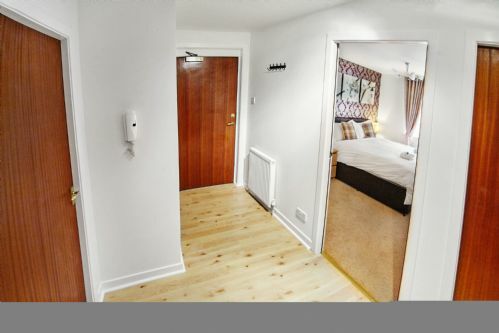 Ideally located half way between town and university. Apartment equipped with everything we needed for a short stay. Had a great stay at the apartment. It was clean, finished to a high standard and in a great location! Customer service was excellent and extremely helpful at all times. Cannot recommend highly enough! Booked this for my bridal party as i was going wedding dress shopping. It was big enough and had everything we needed. It was great for having a girly night in, and close to where we had booked for our night! Loved it. Very convenient for town and university, which is what we needed. Lovely apartment and great service! We thought the apartment was excellent and very clean apart from the very stale smell of smoke. This was not Lucas fault but I assume the guests before. It was the only fault and aside from that, it was immaculate and very comfortable. The rooms were a good size. The kitchen has a table which can sit 4 that was excellent.It was great to have a parking space. Three generations of us stayed here for a weekend and loved it! Safe for the toddlers as well as the adults. Had everything we needed and was lovely and clean. The staff who took our booking were so accommodating finding extra cot bed and giving us early checkin and late checkout so we didn't need to hang around with luggage and children. Will stay again - well worth it! Great flat, it was spacious and clean and in the perfect location! We would highly recommend!! this company if you are thinking of a stay in the ovely Aberdeen. Excellent accommodation - ideal for what we were looking for, quiet location, very clean and comfortable flat. Easy access to city centre shops and beach. Free parking was an added bonus. Would definitely book to stay here again. I really enjoyed my stay. The apartment was lovely and very clean. We were also able to extend our stay for an extra night. Lucas was very pleasant and easy to communicate with. The apartment is an easy walk to the city centre and the beach. I would highly recommend staying here. Although we only stayed for two nights, the apartment was great. 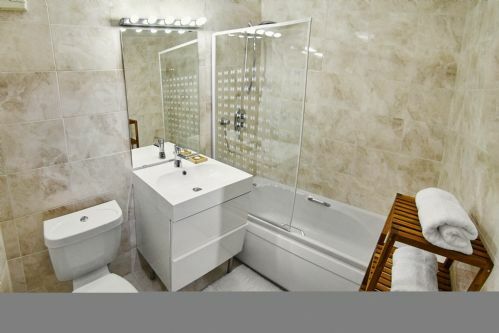 Very comfortable beds, large kitchen and living room, brand new and very clean bathroom. The rooms are quite small but definitly big enough for two people + suitcases. We were even provided towels and small bottles of soap. The kitchen is bigger than we expected and well equipped. It was perfect for our stay. Excellent communication prior to arrival and friendly welcome on arrival. Flat is spacious and comfortable with everything required for self catering. Close to the university and sports village and within longer walking distance of the city centre. I would use thistle apartments again. Overall a very nice apartment. Ideal location for the city centre, university and beach. It also has private off-road parking which is very convenient. The apartment itself is self contained, has everything you need.The beds are comfortable and i had a restful sleep. It is well looked after and very clean. The only downside is, and this is only a small thing, there is an unpleasant smell as you walk into the apartment block. I guess the apartment owner cannot do much about this as he doesn't own that part of the building. The apartment doesn't smell though so that is good. I would definitely recommend this apartment, especially if the smell in the apartment block hallway gets sorted out. We booked the Apartment as it was in a quiet area as we have a 1 year old. The area was fantastic as we could walk to the beach area and also Union street in a short time. The facilities provided was first class for a short or long stay as it was just like being at home. Very clean modern property. 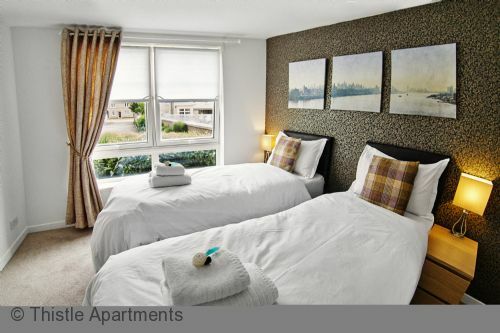 If this apartment is available next time we are in Aberdeen we will be very happy. The spat sent was. Very good for our business trip. The only drawback was that pervious occupants must have smoked and there was a very stale smell of smoke throughout the apartment. The apartment is modern and in excellent condition. The location was perfect for our needs. A short walk into town (bars and restaurants) and a shorter walk to the Sports Village. There are shops nearby too. We would definitely return. We stayed two nights and the apartment was very clean and comfortable. Close to two supermarkets and to the centre. Kitchen was well equipped and we found all we needed to prepare our meals.